If you love delicious puff pastry almond cream cakes, France is the place to be in January. That’s the month when no matter who you visit or when you visit, you are pretty sure to be served a galette des rois for dessert or with your coffee. The galette des rois literally means the cake of the Kings, referring to the three wise men (les rois mage in French or the magi Kings) but it is really more than a religious holiday in France nowadays. Check below for the French galette des rois tradition and how you can easily prepare a homemade galette des rois in less than 15 minutes – oui c’est vrai (yes, it’s true)! When do you eat the Galette des Rois in France? The galette des rois is typically enjoyed starting on the first Sunday of January when January 6th (the 12th day after Christmas) does not fall on a Sunday. In reality however, some gourmands start as early as January 1st and keep going until January 31st. We have our shares of galette des rois on both sides of the Atlantic but we like to have our first galette des rois on the first Sunday of January and then after that, we stop counting. And so one, until everybody gets a slice. Then the suspense is grand…and you hear “j’ai la fève!” (I got the fève). 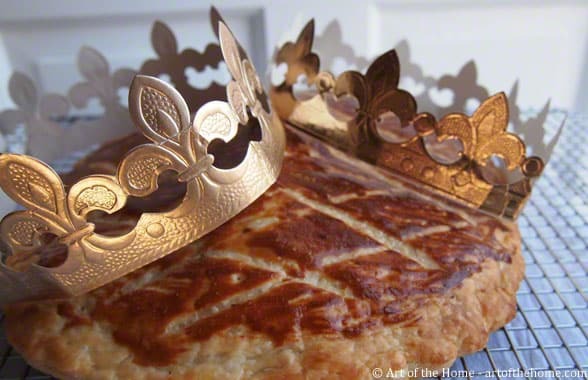 The happy king (or queen) is then crowned and he (or she) gets the other crown (bakeries always provide 2 crowns with each galette des rois) and chooses who will be his queen (or her king) and places the crown on their head – such sweet memories. And it is always so endearing to see a young boy choose his mother or a young girl choose her father – such love and joy in their eyes! Now how about the recipe? Believe it or not, It’s very easy and only takes 10-15 minutes to prepare. To be honest we did not know that, it always looked so special and magic, we thought it would take hours. In fact, we probably would have never ventured to make a homemade galette des rois if we had been able to find some in the US. We did find a French bakery selling them many years ago but we kept looking for the feve and there was none (imagine our disappointment – no feve, no king and queen)! The following day, I went back and told the baker (a French baker!) that he forgot to put the feve in his galette des rois so we needed to get another one. 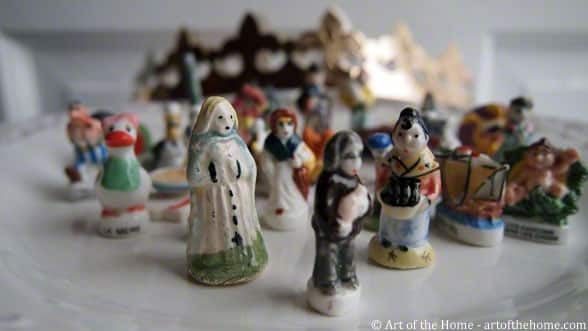 I was shocked to hear that he intentionally had not put one in because he did not want to be sued in the event somebody would chock on it (I even offered to give him one from our family collection but he said “oh non, madame!”). So that was the defining moment here – I looked at old family recipes (that was before the internet!) and decided to go on my own galette des rois journey, that was the last time I bought a galette des rois in the US (we still buy some in France from local pâtissiers we trust but we bake them as well). To my surprise, it is actually very easy to make so I hope you’ll give it a try too. 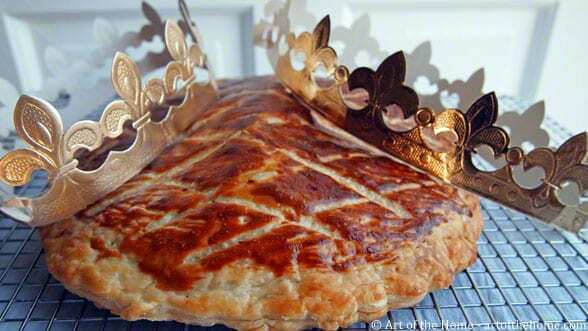 Simply check below the Art of Home easy classic galette des rois family recipe. Enjoy baking it and eating it – bon appétit! Preheat oven to 390 °F. 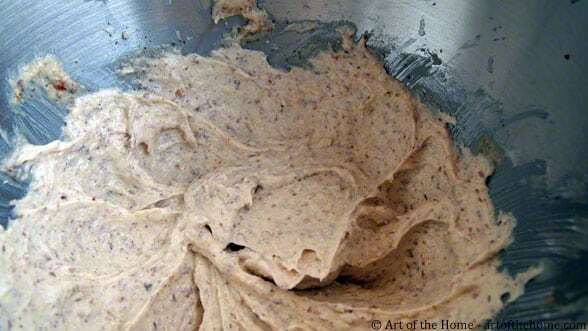 Prepare your almond cream (crème d’amande) by mixing the almond powder and the sugar. Add softened (slightly melted is OK) butter and mix until you get a crumbly mixture. Add in the Grand Marnier. This will give a nice hint of orange flavor which marries very well with almonds. But you can certainly substitute kirsch, cointreau or even rum if you would like. Mix in 2 eggs one by one. Save the third one for glazing. Mix in the sifted flour – this will give a nice consistency to your almond cream and make sure it is not too runny. 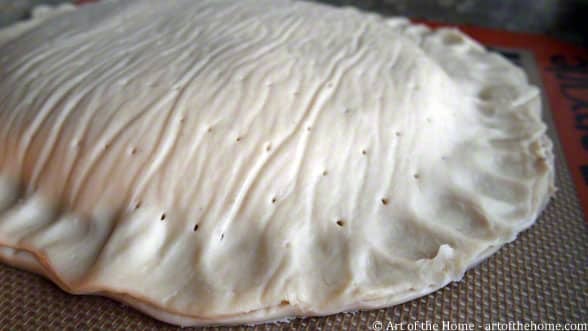 Place one of the puff pastry sheet on a cookie sheet lined with your Silpat or parchment paper. You can use a plate to make a large circle but we simply round the edges with a knife so the pastry sheet looks like a circle. Spread your almond cream on the puff pastry circle. Start at the center and leave about one inch on the edge. Now the fun part — place your feve on the almond cream. Make sure to place it closer to the edge and not at the center. Separate the last egg and brush the edge of your puff pastry circle with the egg white. This will help attach both layers of your puff pastry circles. Now, using the back of a butter knive, push the edge of both circles towards the center but just a little bit to make the pattern you see in the Step 4 picture. Not only does it look pretty, it also seals the edges better. If you are not using the Trader Joe’s puff pastry which already has holes in it, make a few holes on the top pastry circle (about 6 or so). 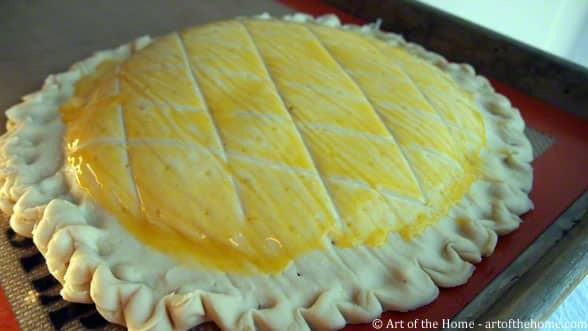 Brush your galette with an egg wash (egg yolk mixed with a few drops of water). 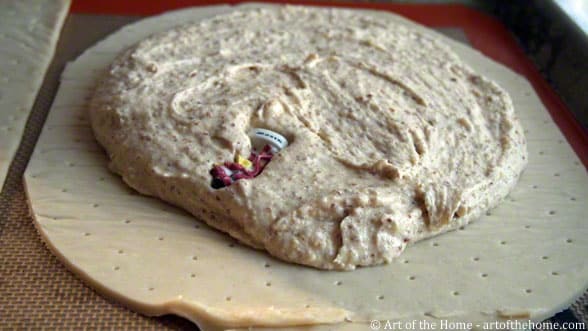 But don’t brush the side or come too close to the edge, this would prevent the puff pastry from rising. 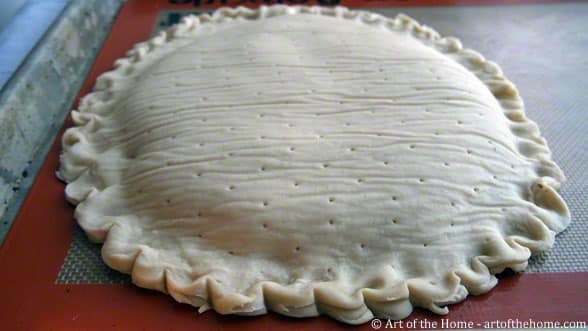 Make the pattern by drawing diagonal lines with the back of a butter knife but don’t press too hard you don’t want to pierce the top galette (see pattern on Step 5 picture). Bake in pre-heated oven for about 30-35 minutes – start monitoring at 25 minutes and if it browns too much you can cover the galette des rois with an aluminum foil. Very important: don’t open the oven during the first 20 minutes otherwise your galette will deflate. Serve warm. If you made it ahead, simply warmed it up for a few minutes at 325-350 °F in the oven (better than microwave so the crust stays crispy).